The relationship between blood pressure (BP) and cardiovascular events is continuous and therefore the distinction between normotension and hypertension is arbitrary. Despite this, for practical reasons, this distinction is commonly accepted, although a number of studies have shown that cardiovascular risk is increased when BP values are in the upper range of normotension. For this reason US Guidelines have proposed a distinction between normal BP and “prehypertension”, the condition in which SBP is between 120 and 139 mmHg and/or diastolic BP is between 80 and 89 mmHg. European Hypertension Guidelines define “high-normal BP”, as a SBP between 130 and 139 and/or a DBP between 85 and 89 mmHg. Despite the differences in cut-off values, studies have shown that these two conditions are associated with a greater prevalence of organ damage, a higher risk of developing hypertension and an increased risk of cardiovascular events. 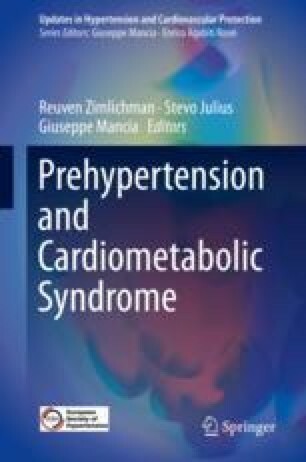 In a general population in Northern Italy we have evaluated the progression to hypertension and the development of target organ damage in 420 subjects who were divided, according to BP values at the baseline visit, into three groups: normotensives (NT) (SBP/DBP <130/85 mmHg); high-normal (HN) (SBP/DBP >130/85 and <140/90 mmHg) and hypertensives (HT) (SBP/DBP ≥140/90 mmHg). At baseline and at a follow-up (FU) visit (performed after 9 years) all subjects underwent clinical examination, laboratory tests and ultrasound assessment of cardiac and vascular damage. Among patients classified as HN at baseline (30% of total), 71% developed hypertension at FU, 18% had HN BP, 11% were NT. Among subjects classified as NT at baseline, 34% developed hypertension at FU, 23% were classified as HN and 43% were NT. At follow-up in HN and in HT, as compared with NT, a significant increase of carotid IMT and LVM was observed. In conclusion, high-normal BP is a common condition in the general population; patients with BP values in the HN range not only frequently develop hypertension in the subsequent years, but also show a greater progression of preclinical organ damage.